Last year for one reason or another (I cannot recall why) I picked up a copy of Peter Drucker’s book Innovation and Entrepreneurship. I was amazed when I found this title to the second chapter, “Purposeful Innovation and the Seven Sources for Innovative Opportunity”. I was even more surprised when I saw his list of Seven Opportunities for Innovation. It is not a perfect fit but the parallels to Genesis One’s Seven Days of Creation seemed more than coincidence. 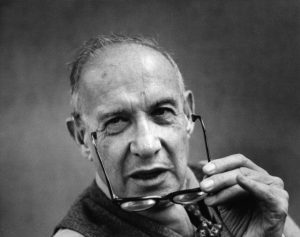 Who is Peter Drucker and where did he get these ideas? Born, Peter Ferdinand Drucker, November 19, 1909 in Vienna, Austria. It appears he was born to a Lutheran home of Jewish origin. This may sound strange to our ears but was likely more common 100 years ago in Europe than many would expect. Early on in life Drucker was drawn to study innovation and entrepreneurship because of a family friendship with Austrian economist Joseph Schumpeter. I expect his Judeo/Christian background had an impact on his thinking and helped him create his “Seven Opportunities for Innovation”. 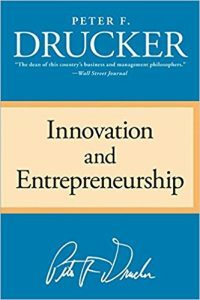 Drucker made his way to American and became a very well thought of business consultant writing many books and guiding the world’s business leaders in the economically booming post war years with great insights for management and marketing. He liked to say “others focus on prices of materials while I was interested in the behavior of people.” His work consists of well thought out principles on how a business organization can bring out the best in its people, build inspired community and protect dignity for the individual in large organizations. Later in life he also had a big impact on non-profits as well, including some of the modern mega churches i.e. Saddleback and Willowbrook to name a couple. In addition to “Innovation and Entrepreneurship“, he wrote more than 30 other books. 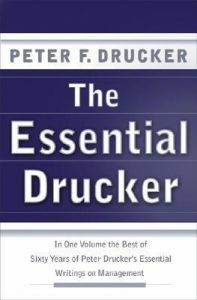 Anyone who is actively involved in managing people in a business or non-profit setting one may wish to acquire a copy of The Essential Drucker: the Best of Sixty Years of Peter Drucker’s Essential Writings on Management which was compiled by Harper Collins near the end of his life. Drucker is clearly a man who in one form or another embraced the Creation Seven. As a creator himself, he reflected the image in which he was created and encouraged others to do likewise. He may never have revealed his ultimate source but his success speaks of its credibility. I do have a complaint about Drucker’s “Seven Opportunities for Innovation” It seems to me that his number 7 “New Knowledge” should have been a part of and added to number 6 “changes in perception”. Drucker tells us that the “changes in perception” of 6 is to see the glass as half full. In other words, attitudes turn positive in 6. He also acknowledges that the best opportunities are the early ones and the later ones have diminishing returns and are less powerful. I would contend the biggest opportunity for innovation is created by rest or Sabbath in the 7th time period. Which in turn then puts the follower of this pattern in the best position for number one “the unexpected” or as Genesis 1:3 says: “let there be light”!